Mix ground beef, paprika, cumin powder, chili powder thoroughly and refrigerate. In a large pan, heat 2 tbsp. of butter in medium-high heat and add finely chopped garlic cloves. Add meat mixture, stirring frequently until cooked through. Stir in diced onions and finely chopped oregano leaves. Add salt and pepper to taste, then stir through finely chopped parsley. Make two discs with each sheet of pastry. Brush 1 egg white, beaten around the edge of each disc of pastry. Place filling in centre of each disc, top with a slice of boiled egg and 2-3 slices of olives. Fold disc shut and press edges with a fork to seal. Place on baking sheet and brush tops of empanadas with egg yolk, beaten. 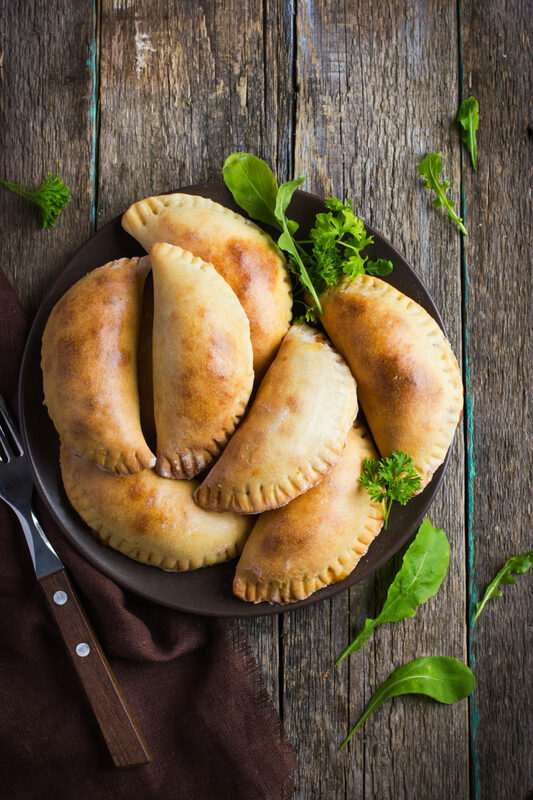 Bake until golden-brown, approximately 20-40 minutes, depending on the size of empanadas.